Before I discuss the stories, I want to raise a small bone of contention about the “illustrated volume” claim. While there are indeed images of cats inside the book—by my count 9 (and one of those is technically a visual poem)—they are inconsistently placed throughout the pages and, with one or two exceptions, are clearly works of amateur artists. I don’t mean to slander the hands who created the images—because the joy in their creation is evident—but most are perhaps better described as “loving doodles” than proper professional book illustrations (from the dark aura surrounding several of the hand drawn images, it is clear that they were originally drawn on paper that was then photographed and then the photos included in the book). I admit that I was disappointed with the pictures, and I think the volume would be stronger without them. 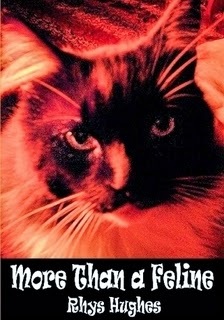 Now to the writing: More Than a Feline is made up of a hodge-podge of short stories and poems about, obviously, cats. Many of the inclusions—such as “Autumn Cat,” “Silky Salathiel,” and “Bangers the Mash”—are sweet and silly poems and stories that would make excellent reading to/with a child. Other tales, however, are entirely adult in tone and content. The 1.5 page story, “The Cat,” for instance, is gruesome twist on the responsibility of neutering, and one of the longer pieces, “When Pushkin Came to Shovekin” is quite absurd and weird, so its humour might miss the mark with anyone who doesn’t enjoy word play as much as Hughes evidently does. My favourite story of the collection is “Cat o’Nine Tales,” about a cat named Herodotus who visits the filthy kitchen of an even filthier tavern cook, Giovanni. As Giovanni clangs around the kitchen, preparing food for “buccaneers and privateers of the port,” Herodotus regales him with recountings of how he used up 8 of his 9 cat lives, each death more fantastical than the last. There’s travel, sorcery, and a surprise ending—which makes it one of the more coherent stories in the book. All in all, More Than a Feline is a book best enjoyed with company on a lazy Sunday or a similarly slow (or silly) day (but if reading with a child, make sure to read through everything first and skip the ones not appropriate for younger audiences). I already know that I will be passing this collection of absurd short stories and silly poems on to other cat lovers to read. Like our favoured whiskered companion, More Than a Feline is unpredictable, amusing, confusing, and best engaged with on its own terms.